The woodworker who snared the $100,000 top prize in GQ/Kettel One’s 2012 Gentleman’s Call contest for his innovative idea of making “beetle kill pine” furniture also happens to be a satisfied customer of Safety Speed Manufacturing. Corbin Clay, owner of Azure Furniture in Denver, CO, gives wood milled from dead trees ravaged by the mountain pine beetle a second life. 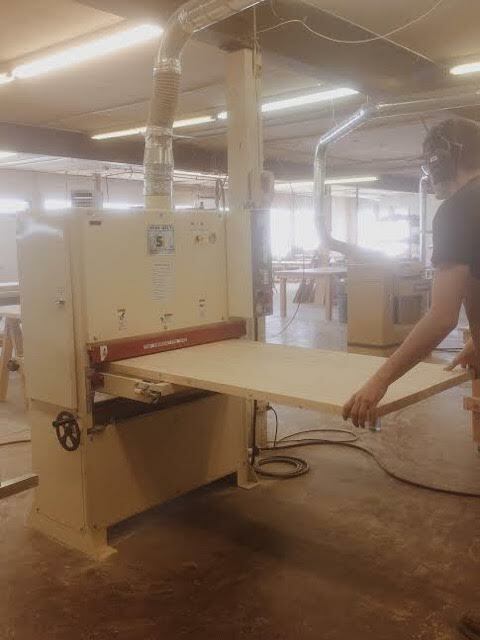 Virtually every stick and board of pine used in Azure’s furniture and specialty items is finish prep sanded on a Safety Speed 3760 widebelt sander, which Clay dubbed a “workhorse” of his four-man shop. 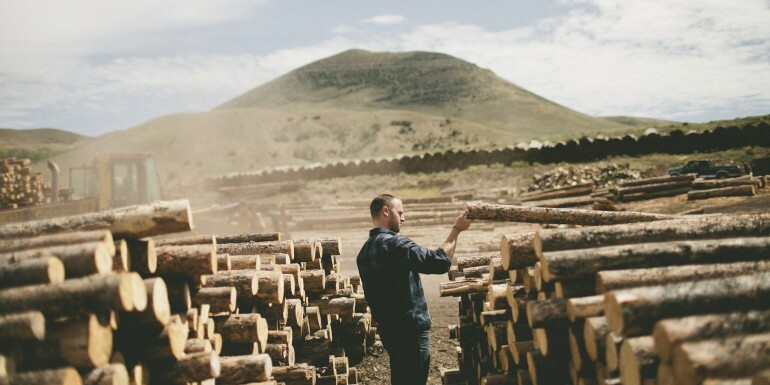 Clay launched his business in 2009 with the express intention of utilizing wood salvaged from the area’s abundant stands of pine trees overrun by the pesky beetle infestation. Adult pine beetles swarm a tree, burrow beneath its bark and spread a blue stain fungus that disrupts the flow of food and water through the tree. Their larvae further impede the travel of nutrients from the needles to the roots. The effected trees essentially starve to death. A tell-tale sign of beetle kill pine wood is the bluish-gray steaks created by the fungus. Clay was inspired to name his furniture company Azure, a rich blue color. The pine mountain beetle infestation, which the USDA Forest Service says “cannot be stopped,” has created a wide wave of destruction leaving millions of lodgepole pine and ponderosa pine trees dead or dying in its wake. The Forest Service estimates that 3.4 million acres in Colorado alone have been impacted since the outbreak began 20 years ago in Rocky Mountain National Park. A native of Ohio, who learned woodworking working for a German craftsman in Clearwater, FL, Clay said he was unaware of the pine beetle epidemic when he first moved to Colorado. “I was working for a kitchen and bath company in Boulder. We built a kitchen for this house that had a tongue-and-groove ceiling made with what was obviously pine but had all of these blue streaks on it. I asked the contractor and my boss what the scoop was and they filled me in about beetle kill,” Clay said. Rather than attempt to compete with well-established custom cabinetmakers in the area, Clay decided to take a different tack. “I set out with the goal of creating a brand around Scandinavian design, beetle kill furniture. I wanted to position my company as the expert of this. From a business standpoint I wanted to standardize because if you are full custom one week you’re doing turned leg tables and the next week you’re doing a bunch of circles that require a jig for that. Eventually you have to invest a lot of time and money in equipment for something you might use three times a year. It’s also hard to charge full custom. You think it’s going to take you two weeks and then it takes two-and-a-half weeks to finish a piece. “Whenever we look at new equipment we start by looking for Made in America,” Clay said. “We’re a small U.S. manufacturing business and we know that cash flow is huge and we know the difficulties and the benefits that go along with it. Safety Speed is not that much different from us. We were looking at the small 36-inch widebelt sander and looked at some other entry level units. The SSM machine is the exact machine that I did my training on in Clearwater, FL. I was already familiar with the machine, the price was right and the Safety Speed Manufacturing team is fantastic to work with.” Clay said his familiarity with the machine shortened the learning curve for finding optimal machining settings to sand beetle kill pine. Clay said his current focus is growing his business, including plans to add a new bedroom furniture collection this year. In addition to residential furniture, Clay would like to grow the commercial and hospitality side of his business. Last year Azure Furniture manufactured furnishings for a hotel and big office project, he said. And that means more work for the Safety Speed widebelt sander. Learn more about Corbin Clay and Azure Furniture at www.azurefurniture.com.